Kohlrabi Kootu is my recent try and I have seen this vegetable in vegetable shops but held myself back to get this veggie as not being familiar with this veggie. Few weeks back, I have read the nutritional benefits of kohlrabi in a magazine and immediately got this veggie for its goodness. It has mild sweetness and crispy texture. It is loaded with vitamin, dietary fiber and best for diabetic patients. 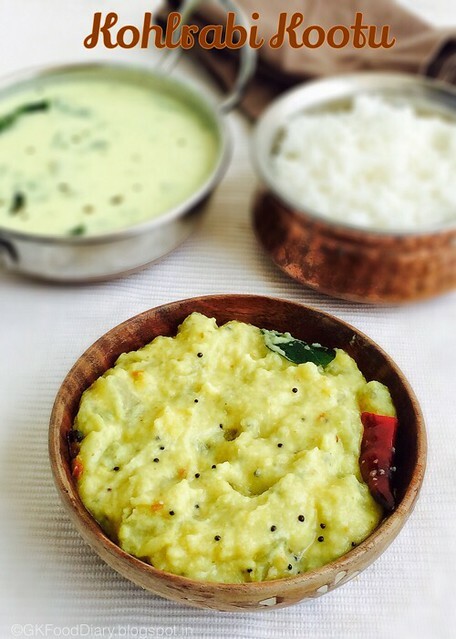 We can also make Sambar, stir-fry or subzi with kohlrabi. 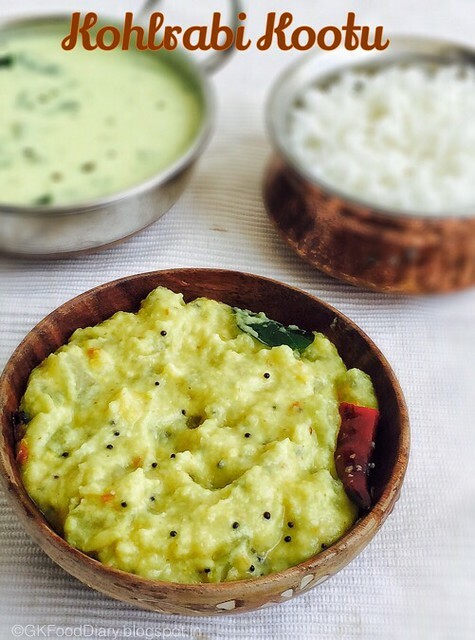 South Indian Tamil Nadu style Kohlrabi Kootu with moong dal. Peel the skin off from kohlrabi and cut into two vertical pieces. Then chop them to small cubes. Keep aside. Grind coconut, green chillies, cumin seeds and fried gram dal with little water to a fine paste and keep it ready. Take the chopped kohlrabi pieces and moong dal in a small pressure cooker and add a cup of water to it. Pressure cook it for two whistles and open the cooker once the pressure released. Now add the coconut paste to the pressure cooked kohlrabi and mix it slowly. Start boiling the kootu in low medium flame for 5 minutes or until the kootu consistency is reached. Switch off the flame once done. Don't boil the kootu for more time after coconut paste is added. Heat a tadka pan and add the items to temper. Let the mustard seeds crackle and urad dal turns brown, then add curry leaves and red chillies. Fry for a minute. Add the tempered items to the kootu and mix it well. 1. Peel the skin off from kohlrabi and cut into two vertical pieces. Then chop them to small cubes. Keep aside. 2. 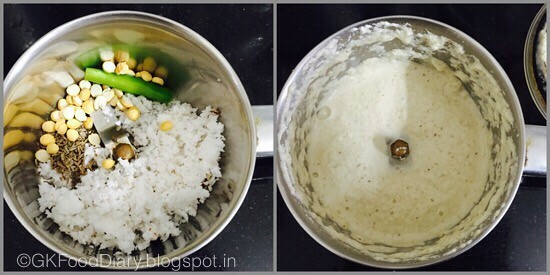 Grind coconut, green chillies,cumin seeds and fried gram dal with little water to a fine paste and keep it ready. 1. 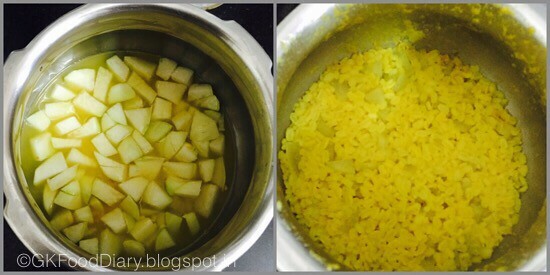 Take the chopped kohlrabi pieces and moong dal in a small pressure cooker and add a cup of water to it. Pressure cook it for two whistles and open the cooker once the pressure released. 2. Now add the coconut paste to the pressure cooked kohlrabi and mix it slowly. Start boiling the kootu in low medium flame for 5 minutes or until the kootu consistency is reached. Switch off the flame once done. 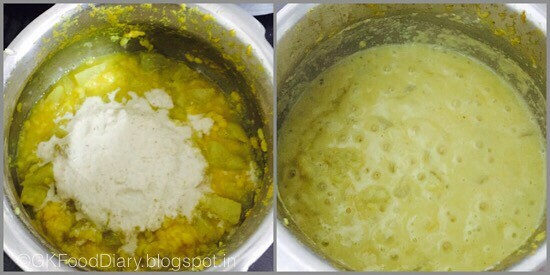 Don’t boil the kootu for more time after coconut paste is added. 3. Heat a tadka pan and add the items to temper. 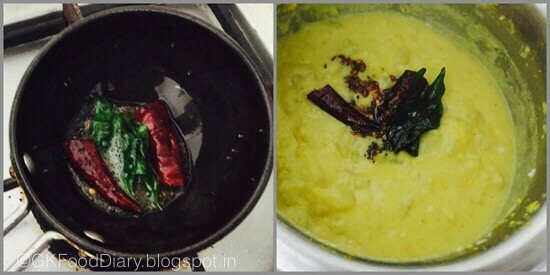 Let the mustard seeds crackle and urad dal turns brown, then add curry leaves and red chillies. Fry for a minute. Add the tempered items to the kootu and mix it well. 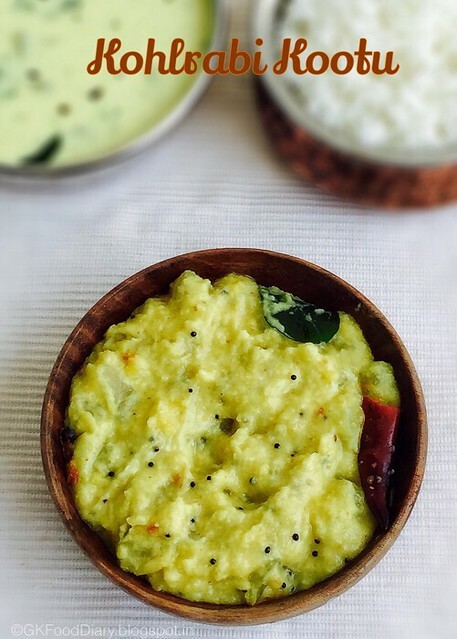 Serve the kohlrabi kootu with steamed rice and any tangy kuzhambu of your choice. We had it with mor kuzhambu.